Try Relay: the free SMS and picture text app for iPhone. Plus, starting today all our readers can get 20% off everything in the Design It Love It shop by entering the coupon code: blogguidebook. Happy Shopping! I am new to blogging and have been trying to figure out how to design my blog page on my own! I would love to take a course on how to do it! The Blog Guidebook has been really great with helping me learn the blog world! I'd love to add buttons on the side of my blog and link them to series I write in hopes of better directing reader interest. Happy birthday and thanks for the giveaway! Happy Birthday! Winning this course would be awesome. I have alway been interested in learning more about blog design. Eeep. . how grand. I'm always looking for things where I don't dig into HTML. I want to focus on content and have the design be a lovely draw. I've been blogging for a year but I've just added bits and pieces at a time so I feel like it needs a bit of an overhaul. I'd love to add drop-down menus at the top with links to posts in different categories to make it easy for people to find posts too. Love your site and all your helpful tips! I'd like to give a new, fresh look to my blog. I would change its background colour. Wow! What a great giveaway. This will be very helpful to one lucky person!! 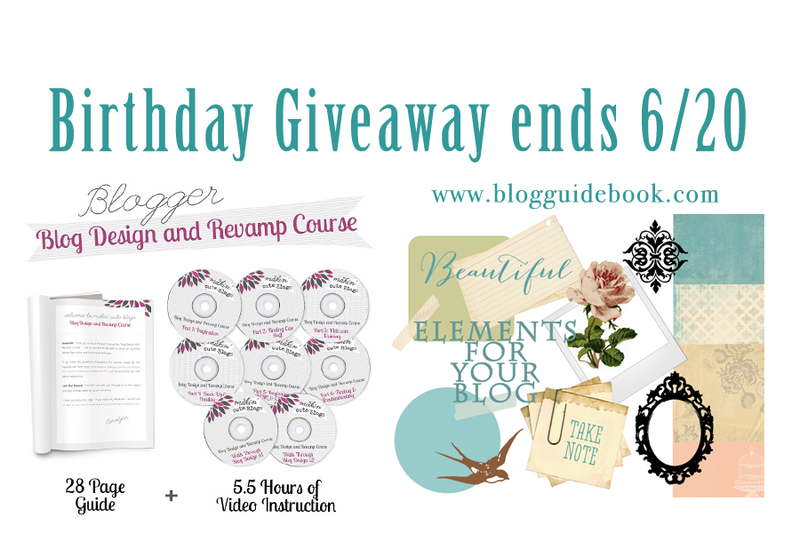 This is such an amazing giveaway, I'd love to know more about designing and revamping! I would love to just say I did it myself! I want to start a blog and this would be great! I would love more tips on revamping my blog - I've done it all myself, and I need lots of help with tweaking! Thank you for this opportunity! I would like more help on customizing a blogspot blog. A blog design must be simple, not many photos and icons. I love looking at your tutorials. I am a new blog designer and these would really help out. Comments are how we stay connected as bloggers. Let us know how you feel and we'll return the favor...stay calm and blog on!!! And guess what? You'll never find Word Verification on our blog...it gets kind of annoying when you can't read what WV wants you to verify right? The Blog Guidebook has TONS of great tutorials and resources available for bloggers who are looking to spice up their blogs! Seriously...if I haven't linked to anything you've found helpful yet...check THIS one out for sure! !